Our Summer Reading Program was a big hit again this year. All the participants received the satisfaction of meeting their reading goals and the fun of getting prizes for doing so. 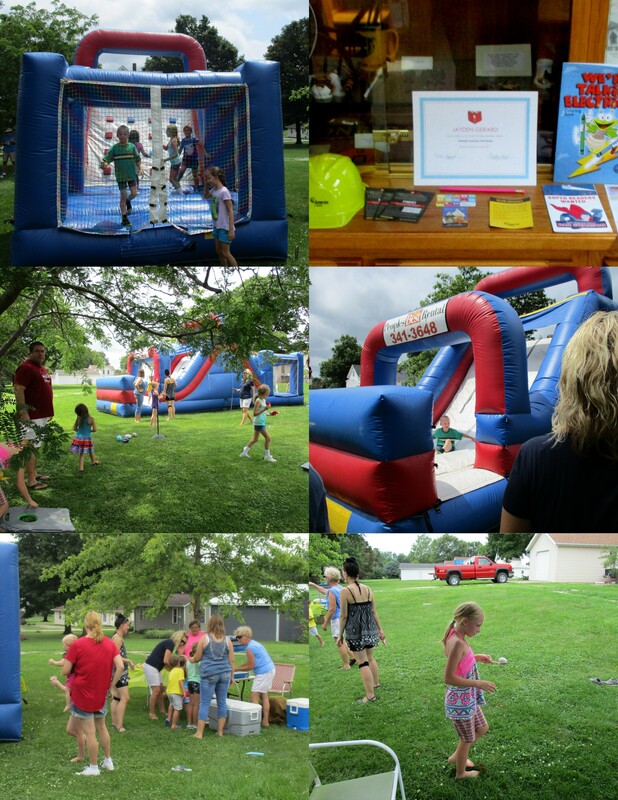 Our End of Summer Reading Celebration was a sensation with the kids and the parents. The kids played in a large bounce house with a climbing wall and a slide. For both the parents and the kids there were games such as a bean bag toss, a hoop throw, board games, and skill games like walking with a raw egg in a spoon. Everyone enjoyed the snacks, fruit drinks, water, snow cones, popcorn, cookies, and fruit. 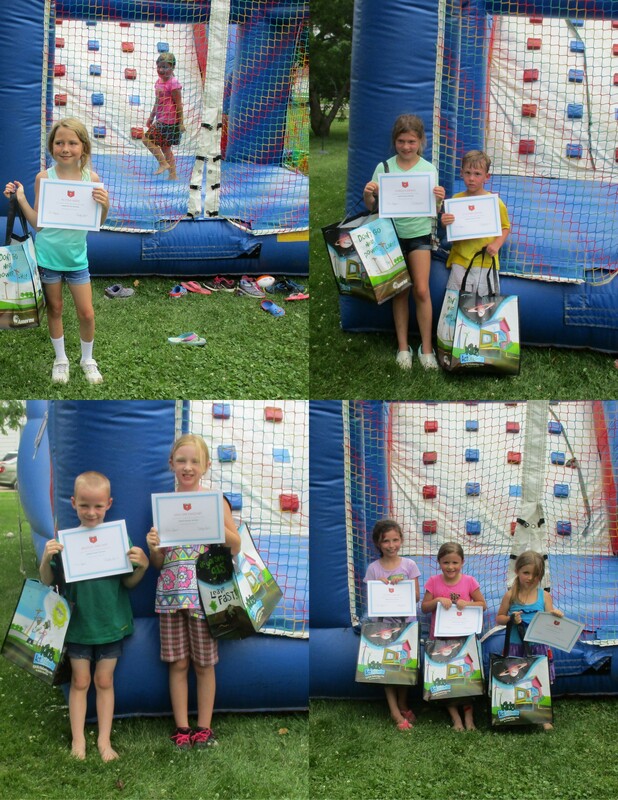 Each Reading Program participant received a goodie bag with a Certificate of Completion, prizes and coupons. They each were given the opportunity to choose as many prizes as they wanted from the treasure chest and to choose the books they wanted from a wide selection of childrens books. We would like to extend a huge thank you to our sponsors and helpers: The George and Marilee Miller Foundation R.O.W.V.A. High School Sr. High Activity Fund R.O.W.V.A. Public Schools Foundation Ameren McDonalds Pizza Hut The Friends of the Greig Memorial Library and all the others who volunteered and helped out. We look forward to seeing you all next year. Our Summer Reading Program is still going. One of our events is the every Wednesday Craft Night at 6:00 pm here at the Library. Last time the kids built race cars and raced to see which were the fastest and sturdiest. There is still time to sign up and participate. 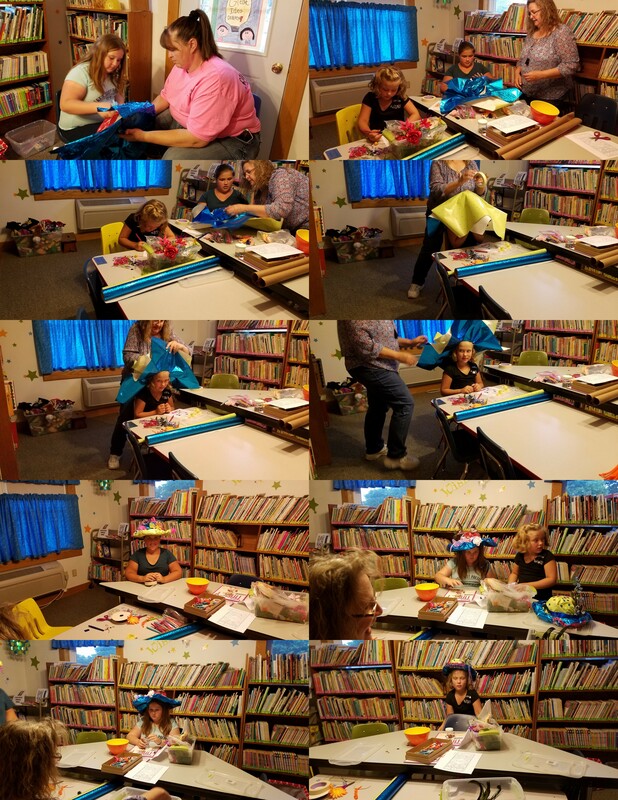 These are some of the participants in our Summer Reading Craft night. If your children aren't signed up yet, or if you know kids that are not signed up, there's still time! Come in and join the fun! The assembly at the school was a hit again this year. 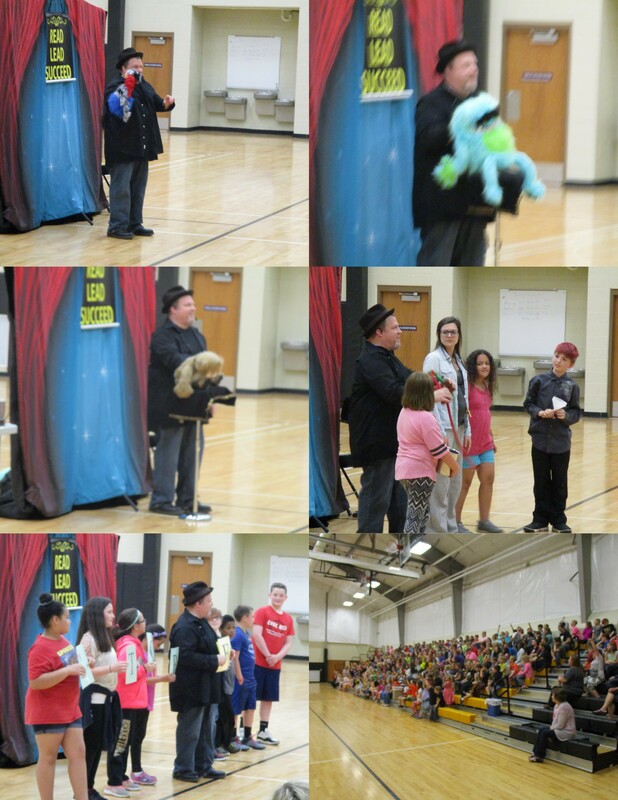 The Magic Storyteller brought some of his friends to help promote reading and our Summer Reading Progam. He brought a bird, a cat and a yeti to encourgae the kids to read. There was audience particpation in helping a teacher become a water spout and there was a spelling bee pitting boys against girls. Stop by the Library to sign up. 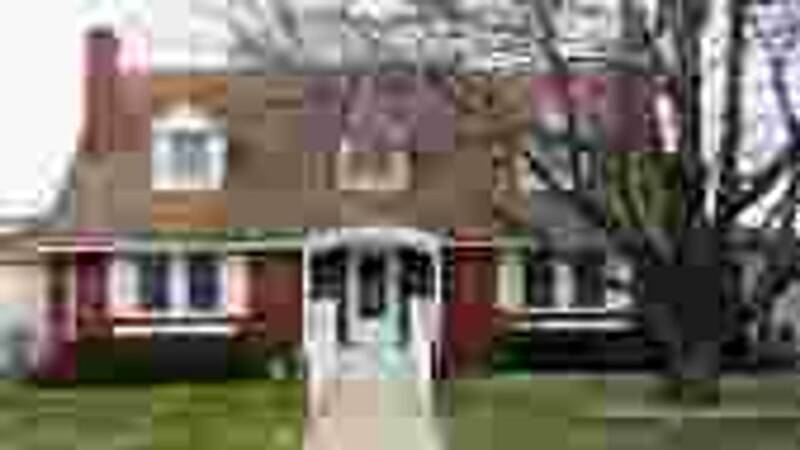 or call for details. A reminder: your Library will be closed Saturday, December 24th and Saturday December 31st. We hope you have a wonderful holiday. Another interesting seminar from Ken at Ameren. This time he explained how electricity and gas get to our houses and gave a graphic illustration of how dangerous natural gas is by creating a small explosion. As always a quality and informative presentation. Join us for a free winter preparedness seminar. 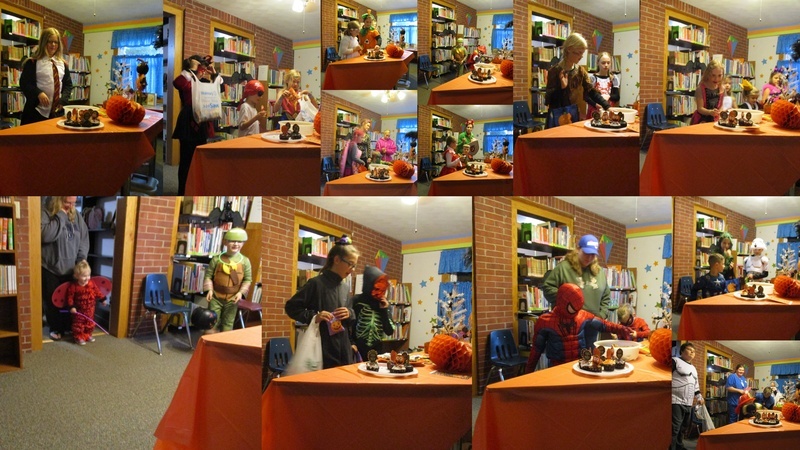 Trick or Treat at your Greig Memorial Library was a scary good time. Over 70 people stopped in for treats and visited our Childrens Room. Stop by on Halloween and check us out. Your Greig Memorial Library has a new visitor. We're trying to convince her to get a Library card. Once again the Friends of the Greig Memorial Library put on a great 5K run. With over 60 runners, family, friends and volunteers we had quite a crowd. Prizes, ribbons and trophies were given out for the various categories. The Overall Female and Overall Male trophies were awarded to Olivia Frail and Caelin Foley by Dave Sheppard, Librarian. Congratulations to all the winners and we thank everyone for participating and helping. Your Greig Memorial Library 2016 Summer Reading Program was funded by a grant from the George and Marilee Miller Foundation. Additional community support was provided by the Oneida Telephone Exchange and the ROWVA Schools Foundation. We also thank the members of the community and the parents that helped with the projects and events. Thank you to everyone who helped make this event the success that it was! The drawing for the Kindles was held and our two winners are Laurabeth Bosomworth and Jaylen Haynes. The Summer Reading Program Swim Party was a great time for everyone! The kids had a great time in the water and on the floats and got the parents participating in the fun as well. The Summer Reading Program is almost over. Don't forget the Swim Party for Readers and their families. The party will be at Hawthorne Municipal Indoor Pool, 2331 Veterans Drive, Galesburg, from 2 - 4 pm on July 17, 2016. All Reading Program registered readers and their immediate families are welcome to participate. If you haven't already, please fill out the reservation sheet at your Greig Memorial Library. The Monarch Butterfly Presentation was very educational and entertaining. Our patrons were shown with pictures, charts and maps when and where Monarchs migrate and how to distinguish between a Monarch and a close look-alike. Our seminar with Ameren Illinois was a rousing success. Our patrons were entertained and educated on Saving Energy and Storm Preparedness. Along with knowledge our patrons left with door prizes and give aways in hand.